Fairview Deacons will be hosting “Trunk or Treat” on Sunday October 28, 2018 in our church parking lot. Church members may participate by decorating their vehicles “trunk” and providing “treats” to our children. 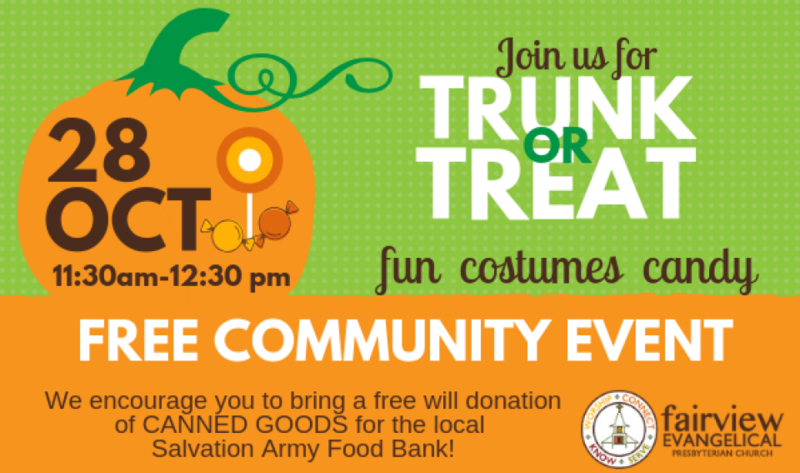 “Trunk or Treat” will begin immediately after worship at 11:30 a.m.
We encourage you to bring a free will donation of canned goods to support the local Salvation Army Food Bank. Thank you for supporting this fun and safe event for our children.